Ghosn: Get serious about "what work should be done outside the company." NEW YORK — Carlos Ghosn wants Renault, Nissan and Mitsubishi to sell a combined 14 million vehicles a year by the end of 2022, and to get there, he says, the alliance will need a lot of help from suppliers. Ghosn, CEO of the alliance, says the coming wave of technology changes means engineers inside the three automakers will have to embrace outside solutions. "The difficulty of the task right now is that we're in an era when most of the parts and technologies we need do not exist yet," Ghosn told Automotive News this month at the alliance's offices here. "Because of the huge amount of new technology coming, the r&d costs are going to go up. We need to converge and have common platforms. And we need to have a much more serious conversation about what work should be done outside the company." 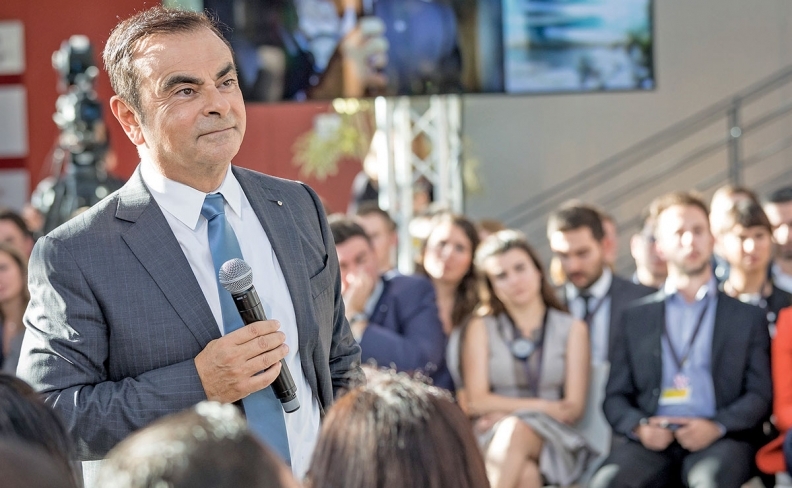 Ghosn, 63, stepped down in April as CEO of Nissan to focus, as alliance CEO, on the job of bringing Renault, Nissan and Mitsubishi closer together with shared platforms and powertrains. He also is pursuing a unified approach to areas such as low-cost electric vehicles, robotaxis and connectivity. That convergence is certain to have an impact on the three automakers' global supply chains, Ghosn acknowledges. Merging a European Renault platform with a Japanese or U.S. Nissan platform invariably means a lower overall head count of suppliers. "There will be people gaining and people declining," Ghosn said. "We will choose and make selections, but it will be based on performance." Ghosn's six-year business plan for the alliance, announced in September, contains a goal of selling more than 14 million vehicles a year by the end of fiscal year 2022, an increase of about 3.5 million from the expected 2017 total. The plan also calls for more shared platforms, common powertrains, a portfolio of 12 or more EV models, a leading role in autonomous technology and entry into the driverless robotaxi segment. Those plans will require the three companies' engineering and r&d departments to share and divide the work ahead. But it also will require them to let go of some in-house tasks. In the summer, the alliance shed its ownership of Automotive Energy Supply Corp., a multiplant joint venture with NEC Corp. to supply EV batteries in-house. Ghosn called that battery business sell-off a perfect example of letting suppliers take over a job that the automaker no longer needs to spend time on. "We're in a period where the demand for resources is huge," Ghosn said. "There are so many breakthroughs coming. Artificial intelligence, all the components of autonomous drive, connectivity — there are plenty of things coming our way. And then you have your usual business and also the emission regulations, where you have to develop and adapt diesel and gasoline engines, transmissions, electric cars and motors. The workload on an individual company's engineers is huge." Ghosn said the alliance is flexible and open to change. He said he was recently "pulled aside" by a key supplier who took him to task for "not listening enough to them," in Ghosn's words. "That's an important point," Ghosn said. "We are now probably one of the largest buyers in the world." He is not in the least worried about the often-cited industry concern that the growing role of suppliers, especially in the realms of advanced safety, electronics and artificial intelligence, will leave automakers playing second fiddle to suppliers on vehicle programs. "You need to make decisions about, what are the parts you're going to build yourself, and what are the parts you're going to delegate to your suppliers?" Ghosn said of automakers. "We have to be pragmatic. What's important is getting the best technology. Nobody has the resources to do everything."